Tympanum of the Golden Gate at King's Palace, Bhaktapur, Nepal. Taleju at the center. The Kumari is a girl, who normally is in the age between 3 and 13 years. She is considered and worshipped as incarnation of the goddess Taleju. You can identify her by her red dress, which she has to wear constantly. She has to wear her hair in a topknot like a pagoda. On her forehead she has the third eye of the wisdom. In Kathmandu the acting Kumari lives in a palace, built in 1757, at the Durbar Square. The palace is named as "Kumari Che", "Kumari Ghar" or "Kumari Bahal". The courtyard is named as "Kumari Chowk". The beginning of the Kumari cult dates back in the 13. Century, in India even back to 600 B.C.. A crucial event of the cult took place 1323, when Hara Singh Deva, a king from north India, on the run to Nepal, brought along his family goddess "Taleju Bhavani". Hara Singh Deva has become king of Bhaktapur soon. And so Taleju Bhavani has become governing goddess of the city. 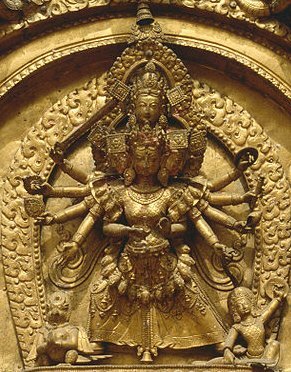 This very day Taleju is the most important goddess of the Nepalese kings and the defender of the Kathmandu valley. Kumaris are regarded as Incarnation of the goddess Taleju. They have appropriate power and highest social prestige by the population. In the course of time the other Nepalese kings also adopted the Kumari cult. Until 2008 Nepal was a united kingdom. King Gyanendra Bir Bikram Shah Dev resided as last in Katmandu. He admired his personal, the "Royal Kumari", but he respected also the existence of other Kumaris. He become king, because king Birendra was murdered in a massacre by his son Crown Prince Dipendra Bir Bikram Shah Dev in the year 2001. On 28. May 2008 the Republic of Nepal was proclaimed with an overwhelming majority. The monarchy thereby was abolished.